Crestline Sunliner "Glass roof Demonstrator hood"
1954 Ford Crestline Sunliner with DEMONSTRATOR HOOD! TRADES/OFFERS? Look at this classic just traded into us! 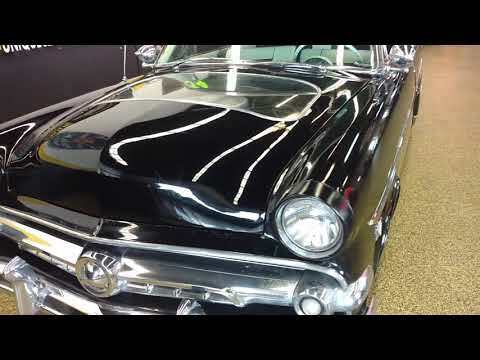 You won't see one of these everyday, it's a 1954 Ford Crestline Skyliner with the "glass top" and "demonstrator hood". There were believed to be 107 of these demonstrator hoods given to dealers to display Ford's new 239 Y block V8 and show it off on their showroom floors. The "glass tops" were only made during the 1954 model year, add that with the "demonstrator hood" and you can see why these are quite rare. Some if the equipped on this car include spotlights, continental kit, A.M. radio, overdrive, and more! This particular car is driver quality and would need some t.l.c. to be taken to the next level. It has had one repaint since 1954 that does show it's age with chips, nicks, scratches, etc. The interior appears to have been done around the time of the repaint. There is pitting on some of the brightwork. The car does run out decent and we've had it up and down the highway fine. Look over the pics, we've included underside, interior, exterior, engine bay, trunk etc. and please feel free to call us at 507-386-1726 with any questions. You may also email "sales@uniquemankato.com" ALL TRADES AND OFFERS ARE BEING CONSIDERED....FINANCING IS AVAILABLE!